We are told that poets can't change the world - just words on a page with no power in the real world, but poems do change the world, every day, some for the better, some for the worse, but language is moving through us, all of the time. 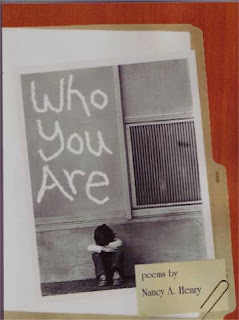 One beautiful proof of this is Nancy Henry's new book Who You Are. She shows us that wisdom, compassion, love and a sense of justice and yes, finding just the right word, can reach into someone's soul, change the way that they see the world, the way that they act in the world, make the world a little bit better place not just for humans, but for all living creatures. Nancy has been to places of pain, places of loss, suffering and despair, has lived through them, uses poetry as a way to look at those experiences, to talk about them, to get them outside of the body into air, light, and language, to make that language into a chant of healing, to help others confront their "moments of doubt and pain", to help us find strength, courage, creativity and heart, to live our lives in a more loving, compassionate, honest way. These are not facile poems of shallow experience, no cute little stories with happy endings. These are poems from the hard world, poems from the heart, the soul, the deep interior, passing through a poet of wise intelligence, empathy and love. There is no better language than the language that heals, and these poems work in that way. Read these poems, and feel your heart change. We invite you to celebrate the March 11 publication of Brett McCarthy: Work in Progress, the first novel by Brunswick author Maria Padian, at Gulf of Maine Books (134 Maine Street, Brunswick) on Tuesday, March 11, at 4 PM. There will be a reading and booksigning, with refreshments. Brett McCarthy is being published by Knopf Books for Young Readers, and is described as a "literary debut with a laugh-out-loud coming of age story about one smart mouthed 14 year old (also the best eighth grade cornerkicker in Maine) who is learning the hard way that she is a work in progress." Please join us in celebrating this arrival of a new Brunswick author! For more information, please call Gulf of Maine Books : 729 5083.